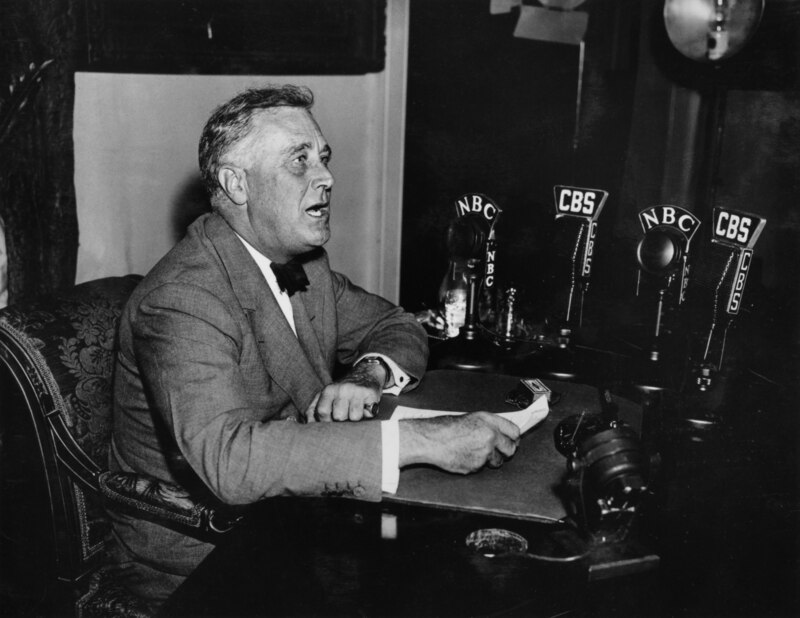 President Franklin Delano Roosevelt sits at a desk as he delivers a 'Fireside Chat' radio broadcast, 1930s. "Bogdanor was “extremely shocked” to find that everything pointed towards Kasztner’s having been “a collaborator” with the Nazis"
“Kasztner’s Crime,” published in October, sets out the case against the Jewish leader in damning detail. Even the most devoted defender might have second thoughts after reading his book." "How much for your Torahs? The oldest Jewish congregation in the Maritimes is looking to sell its treasured parchments"
"The Folly of Excusing FDR on the Holocaust"
Chaim Azriel Weizmann ym"s and Roosevelt collaborated..! Did you ran out of rebbes photos, and turning now on us? stay in your lane. Here is a question I have about Kastner and the way the story is told over: Assuming he was indeed 100% guilty of collaborating with the Nazis, how much evidence is there that he did so out of some sort of Zionistic motivations, rather than simply looking to save his own life? רשימת הנוסעים ב"רכבת קסטנר", נערכה באוגוסט 1944 במחנה הריכוז ברגן בלזן. wasn't the Six Day War a pact with the devil? Reuven and his brother Chaim spent time in the Bergen-Belsen concentration camp and, together with their mother, were among the 1,684 Jews who escaped Nazi-controlled Hungary on the Kastner train, which consisted of 35 cattle trucks that left Budapest on June 30, 1944, carrying them to safety in Switzerland. Kastner, a Jewish-Hungarian lawyer and journalist, negotiated with Adolf Eichmann, the German SS officer, to allow a number of Jews to escape the Holocaust in exchange for gold, diamonds, and cash. Reb Reuven was often asked how he was zocheh to get one of the coveted spots on the Kastner train together with the Satmar Rov, Rav Yoel Teitelbaum zt”l. He explained to his children that his mother, Sasha Elke, who had remarried, was a big “askan.” She was very involved in communal affairs. She was well-to-do and well-connected to influential people, and that was the zechus that saved him, he explained. Q: "Here is a question I have about Kastner and the way the story is told over: Assuming he was indeed 100% guilty of collaborating with the Nazis, how much evidence is there that he did so out of some sort of Zionistic motivations, rather than simply looking to save his own life?" "Kasztner, The murder of most of Nazi-occupied Hungary’s Jews in 1944. Because he was acting head of the "Jewish rescue operation in Hungary", some have hailed him as a savior." The whole re-trial was a scam to exonerate "themselves". Saly Mayer a Swiss Jewish leader and representative of the "American Jewish Joint Distribution Committee" in Switzerland. left plenty of hard evidence of dead end pleas of help. Joel Brand was a leading member, in the 1940s, of "Budapest's Aid and Rescue Committee" smuggled out of Hungary hard evidence of what was happening there, he was held captive by the zionists and British until the end of the war not to alarm the world "the zionists controlled the message" The knew it all. Theodor Herzl, wrote; anti-semitisim is “anunderstandable reaction to Jewish defects.” In his diary he wrote: “I find the anti-Semites are fully within their rights". The prophet Moses, The arch enemy of Egypt was saved by the house of Pahroh ! The Prophet King David our saviour, was saved through "luts" shinanigans..! the list goes on..
any praise you wanna lavish on pahroh or on the king of Sodom and Gomorrah ? against 500,000+ Jews amounts to intentional murder, Kastztner did not need any specific zionists orders he was the ultimate "Zionist/Devil Murder!" and his intentions certainly wasn't to save the arch enemy of his Breed! RJT, the opposite is through if only he would knew. Thoughts about the upcoming yuhrtzayt? A: "how much evidence is there that he did so out of some sort of Zionistic motivation"
Nu, thoughts on the yuhrtzayt? As the present Chortkover Rebbe, I humbly state that I tried to rescue THOUSANDS of Jews from the horrors of the Holocaust. Unfortunately, I was unsuccessful-primarily because I was not yet born. Machshavos tovos mitztarfin l'maaseh.I take pride and solace in that. How does prove what motivated KASTNER? Other groups also refused to give from their funds for rescue work. Why are the Zionists always singled out? "Sara Netanyahu: Israeli prime minister's wife charged with fraud"
Is the "prime minister" next.? or the Belzer rebetzin.? please go back to history101 class, don't insult yourself further. Read: 51 Documents; Zionist Collaboration with the Nazis, is a 2002 book by the American Trotskyist and anti-zionist Lenni Brenner.The book presents 51 documents that Brenner argues show that Zionist leaders "collaborated" with fascism particularly in Nazi Germany in order to build up a Jewish presence in Palestine. The book continues themes explored in Brenner's earlier and highly controversial work Zionism in the Age of the Dictators. Zionism and anti-Semitism before Hitler, The World Zionist Organization and Nazism Before the Holocaust, Zionist Revisionism, Fascism, and Nazism Before the Holocaust, The World Zionist Organization During the Holocaust, The Stern Gang and the Nazi. The Transfer Agreement: The Dramatic Story of the Pact Between the Third Reich and Jewish Palestine is a book written by author Edwin Black, documenting the transfer agreement ("Haavara Agreement" in Hebrew) between Zionist organizations and Nazi Germany to transfer a number of Jews and their assets to Palestine. This book documents the agreement between Nazi Germany and an organization of German Zionists in 1933 to salvage some German Jewish assets and the voluntary emigration of German Jews to Palestine before the Third Reich implemented expulsion and then extermination. The Transfer Agreement rescued some 60,000 German Jews. A sweeping, worldwide economic boycott of Germany by Jews helped spur a deal between the Nazis and Zionists. The book also documents the controversy within the Zionist movement and Jewish diaspora over the agreement, which Black shows "tore apart the Jewish world in the pre-World War II era". In particular, it describes the conflict between, on one side, German Zionists and German-descended communal leaders in the US, who argued for the agreement, and, on the other side, the mainstream Eastern European-descended American Jewish Zionist leaders (such as the American Jewish Committee and Jewish War Veterans) who opposed the agreement and argued instead for a full boycott of Nazi Germany. SSS: "his intentions certainly wasn't to save RJT, the opposite is through if only he would knew." Seixas, as the only religious official in the congregation, functioned as spiritual leader, interpreter of religious law, supervisor of kashrut, performer of marriages and funerals and all the varied duties we now associate with ordained rabbis. Seixas received his Jewish education primarily from his father. He was not a college graduate, but self educated in Talmud and secular literature. In 1780, Seixas relocated to Philadelphia to become hazzan of congregation Mickve Israel.